Crested Butte is an ideal location for a vacation. We offer some of the finest family lodging and vacation home rentals in the area. In addition, the historic town is ideal for weddings, anniversaries, reunions, and any other celebration your life calls for. Skiing is what Colorado is famous for and Crested Butte is no exception. 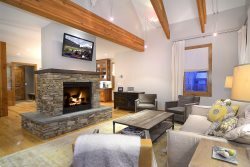 Enjoy our family vacation homes, some of which are located right at the the base of Crested Butte Mountain Resort. Got a golfing family? Wanting something a bit more quiet and out of the way but so close to town? The Skyland Country Club area is the perfect spot for your next family vacation! For the fisherman at heart! Spend your days exploring and fishing right from your backyard! Close to town for convenient shopping and dining, but far enough away for a quiet, tranquil vacation. At Iron Horse, we have the best selection of family vacation rentals in the Crested Butte Area. Not only do we offer top-of-the-line lodging, but our resort location offers a picturesque backdrop to your wedding, family reunion, or any celebration in you and your familys lives.